Fear of success is a strange and uncanny concept. Most of us would never even be aware of the fact that fearing success exists! We like to think of ourselves as smart and conscious human beings. Part of our overall personal development comes with our willingness to succeed various areas in life. We engage in goal setting, positive thinking and affirmations to develop personally and to reach specific goals. The goals are different to each of us, and we all have our strategies for success. So why do we sometimes stop ourselves from success? Fear of failure is common and very "acceptable", but the opposite, fear of success, how does it work and what are the reasons behind? The emotion behind fear of success is sometimes stronger than fear of failure. Subconsciuosly, we often think that it is better to stay "safe" and not achieve too much. Most of us are comfortable with the familiar, and fear the unknown. Staying in your comfort zone is safe, and personal development and success is frightning. No need for fear. 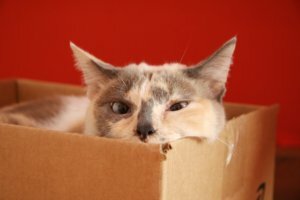 Get out of the box and see what happens! Furthermore, we often make comparisons with our friends and family. If we are about to become more successful than someone close to us, we often stop ourselves before reaching a point of success in life (material, social, mental or spiritual). Subconsciously, we do not want to disappoint others and be better than they are. Does this kind of fear of success seem illogical and destructive? Let´s take a look at why it is common and what you can do about it. Following certain success principles is not hard, and reaching a certain level of personal success in life is doable to most of us. There are plenty of excellent advice that anyone can apply for maximum success in any area. But with success follows personal responsibility and different (higher) demands on you from other people. Some people thrive on high demands, whereas others get mostly stress out of it. If you get anxious about the extra stress, you will most likely begin to fear success too, because it is associated with something negative in your subconscious mind (stress, fear, pain, insecurity...). We are all different personality types, and those who care a lot about the opinion of others tend to suffer more from fear of success. As a natural consequence, you will stop yourself from expanding if you are not sure about what "other people" will think of it. The obvious thing to do is to scrutinize your mind and learn why other people´s opinions are important to you. Then you can do something constructive about the fear, eliminate the cause and continue to expand and grow personally. What can you do to eliminate the fear of success? Examine your values. Examine your thoughts and belief systems. Who would you be if you did not follow other people´s norms and ideas? Who would you be if you really succeeded with whatever you want maximum success with? How would you feel? What sort of consequences would success have to you? Consider both negative and positive consequences. Examine your results. If you have found some factors, scrutinize them carefully and question every single aspect that appears. It is usually hard because you will find some factors of fear of success that you have denied or have not been aware of. So the point is to become aware of your own thoughts. For this exercise you will find the use of a personal development journal really convenient! All over this personal development website, we return to the concept of postive thinking. It is so important to learn how to develop a positive attitude and how to change a negative thought into a positive one. There is an entire affirmations section to refer to for great examples of affirmations; motivational affirmations and affirmations for happiness, prosperity and weight loss are just a few examples. "I deserve success and happiness!" Always phrase your affirmations in the positive and write the good ones down in your personal development journal! Return to your daily affirmations regularly. Do you know someone who has the kind of success you are looking for? Who? Find a role model who you can identify with and copy their success principles and recipies for success as much as you can if they agree with your own values! You can be sure that every successful person has dealt with fearing success aswell! Learn from your role model and continue on your road to personal success too. 4. What is success to you? Define it! Throughout this personal development website, we emphasize the importance of defining your own success. Never follow anybody else´s idea of success. Perhaps yours is mainly spiritual success, whereas somebody else stresses the importance of material success. Only you know what is right for you. Once you have a clear picture of what kind of success you want, it is much easier to deal with any remaining fear of success. By now, you have probably eliminated most of the fear and mainly look forward to soaring to your personal success! Learn more about fear of success from our newsletter.